Now, this is history come to life! Ulysses S. Grant, not just America's 18th President, but also heroic Union general of the Civil War! Your kid wants to be Abraham Lincoln? Pssh, more like Abraham Stinkin' (not really because obviously Lincoln was also awesome)! 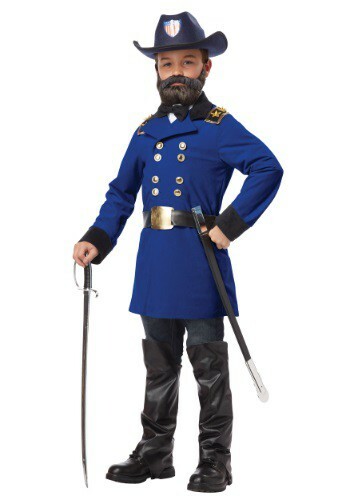 That guy couldn't wear a blue uniform like Grant could! Lincoln is old hat! As a matter of fact, his famous hat must be very old by now! Besides, does Lincoln get a sword? Gold buttons? An incredible beard? The answer to that last question is "yes," but our point remains: Ulysses S. Grant is Ulysses S. Awesome! So don't make your kid be some politician from yesteryear, make him become a cool general! "If you see the President, tell him from me that whatever happens there will be no turning back." "I have never advocated for war, except as a means of peace." "I know only two tunes: one of them is 'Yankee Doodle', and the other one isn't." (if you use this, make sure your child knows "Yankee Doodle", just for kicks). Ulysses S. Grant isn't just an inspiration to beards everywhere, he's an inspiration to these United States of America, to everyone who wears the uniform, and to kids who like dressing up as past American generals everywhere! Received the costume in the time manner posted and the quality/style is good. Just as pictured. Would order from Halloween Costumes again!